The Hotel Louisville has become a lifeline for those without a safe, affordable place to stay in the city. 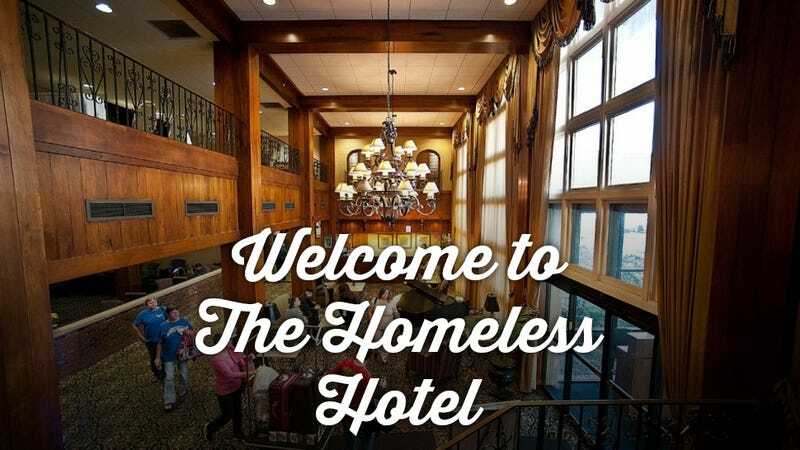 In 2009 the hotel became one of the country's first dual purpose homeless shelter and public hotel.. and it'll shatter your preconceived notions about what a shelter is actually like. Out of its 287 rooms, 116 of them cost $49 to rent for the night, with the rest set aside for transient guests with nowhere to go. If you're in the city to visit a loved one in the hospital, rates drop even lower than the average fifty bucks. Guests staying at the hotel for free take part in work therapy programs that include janitorial duties, meal preparation, and general hotel assistance. Many clients also utilize the option to take part in drug and alcohol recovery programs offered by the hotel. Of course not everyone is happy with the hotel's homeless program. Some have begun criticizing the hotel, claiming they're taking advantage of homeless clientele who make a mere fifty cents an hour while working. In the past 3 years, the Hotel Louisville's annual revenue has climbed from $318, 594 to nearly 1.5 million, but even the mounting criticism hasn't stopped the clientele from singing the hotel's praises. Many of the people who need the hotel to survive say it's been a not only a safe-haven but a life-changer. Luckily, it looks like the hotel will be able to continue helping people in need for years to come. Use Roadtrippers to plan all your road trip fun. Follow us on Twitter and Facebook. This Victorian-era clothing exhibit is to die for. Literally. Museum of Questionable Medical Devices has a prostate warmer. No really.